The Dymock Poets countryside (an informal and unofficial appellation) stretches from May Hill in the south to the Malvern Hills in the north. The area is shown on our Poets’ Paths map. The Ordnance Survey Landranger Maps 149 and 162 cover much of the area, although the Malvern Hills are on sheet 150. 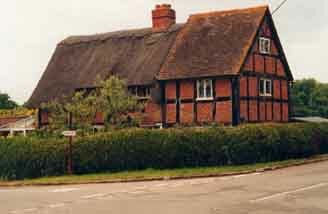 The parish and village of Dymock, in Gloucestershire, is about halfway between May Hill and the Malvern Hills. The River Leadon runs through the area from north to south, passing near Ledbury, then through Dymock, until it reaches the Severn just north of Gloucester. 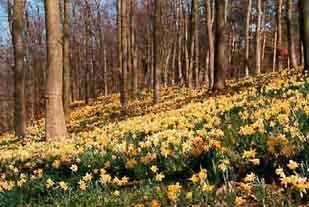 The area between May Hill and the Malvern Hills is most famous for its wild daffodils, which once grew in profusion in the meadows and woods. Despite changes in farming practices there are still many places where wild daffodils can be seen in late March and early April. The villages of Dymock in Herefordshire and Kempley in Gloucestershire organise guided walks and other events on their ‘daffodil weekends’. The Dymock Poets countryside can be best appreciated by exploring on foot or by bicycle. There are two reasonably well waymarked footpaths, which begin at St Mary’s Church in Dymock, called Poets Path I and Poets Path II. The first heads east of Dymock in an 8-mile figure of eight that passes Abercrombie’s cottage, while the second heads north of Dymock in an 8-mile figure of eight that passes near Frost’s, Thomas’s and Gibson’s cottages. (All the cottages that the poets lived in are marked on the maps, but they are private properties.) These maps can be purchased locally and contain notes about the poets and route-finding information. There is a permanent exhibition about the Dymock Poets in St Mary’s Church, put together by local people to commemorate the poets who lived in their neighbourhood. The church is open all day every day. The Beauchamp Arms, next to the church, is popular with walkers and serves bar snacks and meals (telephone 01531 890266). There is also a small exhibition and information centre for walkers and cyclists only, in the garden of a private house at Ryton (house no. 333 - as you cross the motorway bridge, going from Dymock to Ryton, look on the left for a black-and-white cottage set back from the road and facing onto a gravelled drive). If the owners are home you’ll most likely be offered a cup of tea, and given shelter from the rain. 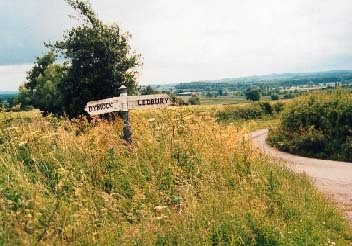 The nearest rail station is at Ledbury (pop. 7,000), a historic and bustling market town with shops, restaurants and hotels situated on the eastern edge of Herefordshire, and just a few miles from the Gloucestershire border. The best place for visitors who plan to stay overnight is probably Ledbury, although there are plenty of B&Bs and farmhouse accommodation in the surrounding countryside. 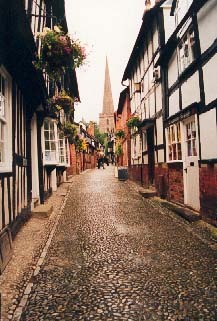 Visit the Ledbury Tourist Information website, or iknow-westmidlands, or browse the Herefordshire website. The smaller market town of Newent, a few miles south of Dymock, can also provide accommodation - for details contact Newent Tourist Information Centre (Telephone 01531 822468). Six roads on a Ledbury housing estate called Capella Court, near the Hereford Road roundabout, were named after the Dymock Poets in 1997. The Malvern Hills are made up of a 10-mile long ridge that is laced with tracks and paths. This is a popular area for walking, with many car parks that get crowded on weekends and holidays. Frost’s poem, Iris by Night, is based on a walk he took here with Edward Thomas in the summer of 1914. There are many guidebooks about the Malvern Hills, many of them with walking routes to follow. These books, as well as more detailed maps, are available at Malvern Tourist Information Centre (telephone 01684 892289), as well as Ledbury Books & Maps (telephone 01531 633226). May Hill is wonderfully mysterious. 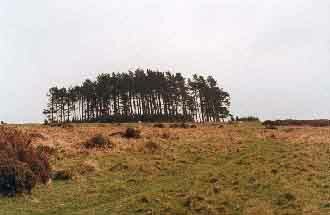 The clump of Scots pine trees on top of what looks like an upside down soup plate make the hill a visible landmark from all over Gloucestershire and Herefordshire - but as you approach it, it disappears. There are some parking places on the tiny lanes around the side of the hill, and there are also two pubs ­ one on either side of the hill. If you time your visit to coincide with opening hours, you could walk up and over and down May Hill (allowing about 1.5 hours), have a drink at the Glasshouse Inn or the Yew Tree Inn, and return to the pub from which you began. Robert Frost and Edward Thomas walked here, and Frost and his wife could see it from their cottage, Little Iddens. They referred to it in letters home. And it’s on May Hill that Edward Thomas began writing Words.